Hillary Clinton’s arrogant reply to a letter on Nov. 4 : “Thank you for writing and sharing your thoughts and concerns with me. I value your opinion and will take it – and the views of all Americans – into consideration. As Secretary of State, I am committed to strengthening America’s national security, advancing the interests of the United States, and restoring America”s leadership position in the world. On June 6, 2012, Korean-American Mr. Soon Cho sent a letter regarding the Jeju naval base project to U.S. Secretary of State, Hillary Clinton (see below). Mr. Cho recently shared on Facebook that he has received a reply from Clinton on November 4th (see above image). 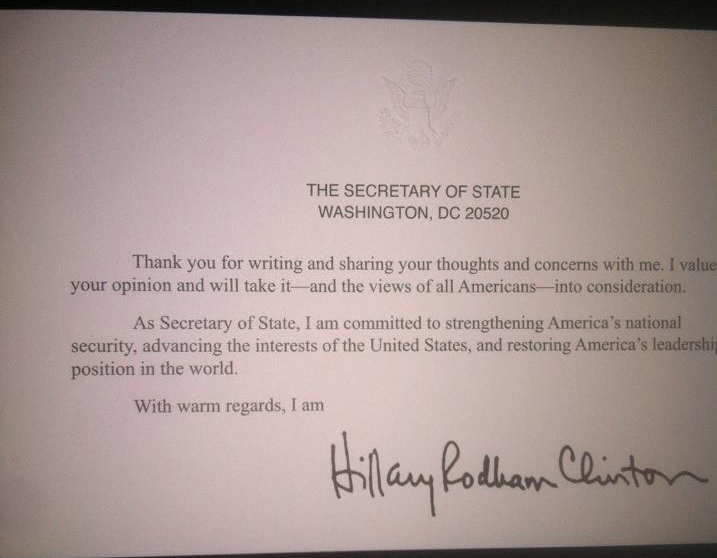 5 Months later, she sent a bland, form-letter response in which she states states that she is, “committed to strengthening America’s national security, advancing the interests of the United States, and restoring America”s leadership position in the world.” In other words, in response to Mr. Cho’s request to do something to stop the construction, “No Way”. I am writing this letter to you because what is happening in South Korea makes me sad. I am so sad that I cry almost every day when I think about it. Three years ago, I made a trip to Korea where I was born. At that time, I stopped by an island called Jeju situated in the most southern part of Korea. This island was so beautiful that netizens around the world voted it as one of the seven beauties of the world. Even UNESCO recognized it as one of the most precious place on earth. 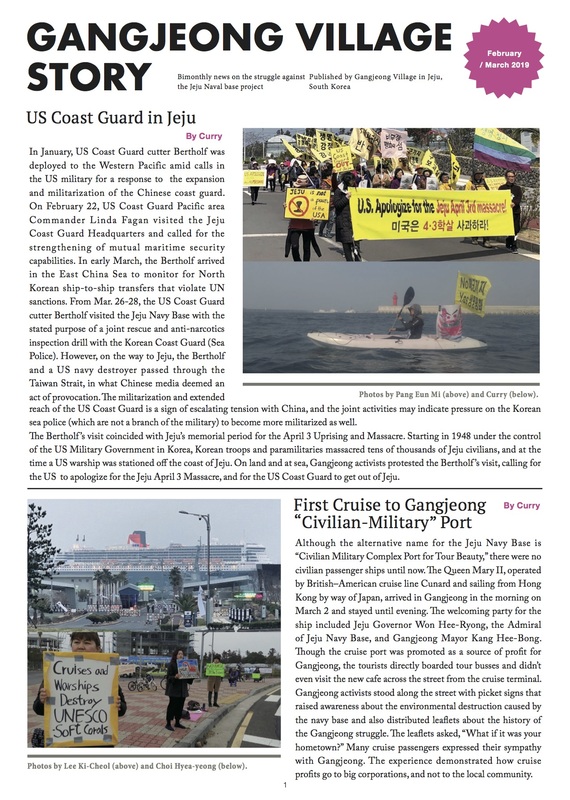 But three years ago, I learned that a new naval base was proposed in a small village called Gangjeong possibly for the US carrier. And village people in Gangjeong have been protesting to the construction of new naval base. But as results they were sent to jail and levied with hefty fines. They are trying to to keep peace not only this island but also keep peace in this far east asia region. South Korea government is building a new naval base in this village under the pretext of keeping Korea from foreign invasion. But the history proves it otherwise. This island was not invaded by foreign force except by Mongolian armies led by Genghis Khan more than 800 years ago. It was not even invaded when Japanese samurais lead by General Hideyoshi invaded Chosun Dynasty in 16th century nor bombed by North Korea Mig fighters during the Korea War. This island was ordained as Peace Island by previous president Roh. Why I am writing this letter to you? Because (1) there is an anti-US sentiment brewing among Jeju people and peace activists, (2) there is enough US presence in Korea already that will prevent any foreign invasion, and (3) I also have a firm conviction that you can convince President Obama and Korean President Lee to reconsider building this naval base in Gangjeong. Many peace activists around the world are struggling to stop the construction of a naval base in this island but so far resulted to vain. I urge you to look into this matter and please help Koreans to maintain peace in the Jeju Island and in this region.